Bill Buxton grew up in Charleston, SC and attended Hampden-Sydney College in Virginia. After completing his JD at the Charleston School of Law, Buxton held the first clerkship in the office of the Master in Equity in Charleston. 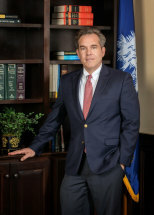 He subsequently practiced in the area of family law with the T. Edwards Law Firm in Charleston before relocating to Sumter in the Fall of 2010 to join Curtis and Croft. Buxton's primary practice areas include real estate transactions, wills trusts and estates, probate and family law.